It all started with Hufflepuff, but now I'm making this a series of blogposts. In this third installment, I'm going to show the world that Gryffindor is the best house! Take it away, Ernie! It's going to be a bumpy ride! As a Ravenclaw who was forced as a child to choose between Gryffindor merch or no Harry Potter merch at all (because no other houses were available), I have to admit that Gryffindor has not always been at the top of my list. No, no, definitely not! No matter... And as a wannabe champion-of-the-underdog, I have to also admit that sometimes I felt annoyed at just how important, just how talented, and just how crucial every Gryffindor seemed in the series. J.K., I thoughtyououghttoknow (I'm killing it with these references today) that I felt super snubbed when Hermione said that bravery was more important than cleverness. This Ravenclaw is a wimp, okay? I get scared by Scooby Doo! Both Rubeus Hagrid and Minerva McGonagall were Gryffindors in their youth - and, one might argue, once a Gryffindor, always a Gryffindor. As far as the adult characters go, Hagrid and McGonagall are hands-down my two favorites (I'm not sure that I can choose between them!). And just the fact that both are Gryffindors shows, I think, just how amazingly diverse this Hogwarts house can be. They have such different personalities, but the most important in each of them is their courage. Minerva is stern, just, brilliant, hard-working, and brave. She stands up for her students. She stands up for her co-workers, like when Umbridge tried to throw Trelawney out of the castle. She is always standing up for what is right, no matter the consequence. Rubeus is a gentle (half-)giant, sympathetic, loyal, kind, and brave. He stands up for animals that can't stand up for themselves. He protects his half-brother (full-giant) from others who are bullying him. He may be large in stature, but his heart is even larger, because Hagrid is always standing up for what is right, no matter the consequence. It's pretty hard to imagine a world in which a Gryffindor is not good, but Peter Pettigrew does give us a glimpse of that (even if he was a Hatstall). In the end, however, in typical Gryffindor fashion, Peter redeems himself by saving Harry's life. Way to go Peter, ruining my one bad (in more ways than one) example. 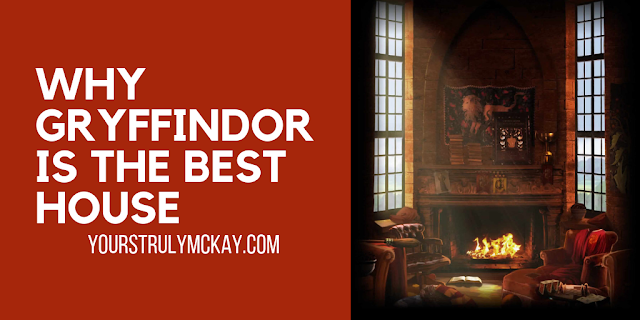 Gryffindors tend to be natural-born leaders, with good reason. I'd compare them most to a "Red" personality: action-oriented, assertive, confident, decisive, determined, disciplined, pragmatic, proactive, productive, responsible, and task-dominant. Now who wouldn't want a leader like that? *picks up mic* You want to be around Gryffindors because above all, they aren't afraid to be themselves. Even if they can get a little spooked trying to ask you to the Yule Ball, their bravery makes Hogwarts - and the world - a better place. I don't want to even try and imagine a world without chivalry and the courage to stand up for what's right. This one's for you, Gryffindors.